A group of architects had drawn up a blueprint for the revival of Gariahat pavements and handed it over to the police a month before a fire ravaged Gurudas Mansion, gutted hawker stalls and two well-known sari shops and endangered several lives 10 days ago. The initiative — titled ‘Gariahat Footpath Revival Scheme’ by Kolkata Architecture Foundation in collaboration with Abin Design Studio — had proposed cleaning up of pavements to make more space for pedestrians, setting up of aesthetically pleasing hawker stalls that are safe and a green verge on the edge of the pavement behind the row of stalls. “Gariahat, which is one of the greatest urban confluences of the city, is reduced to shabbiness. 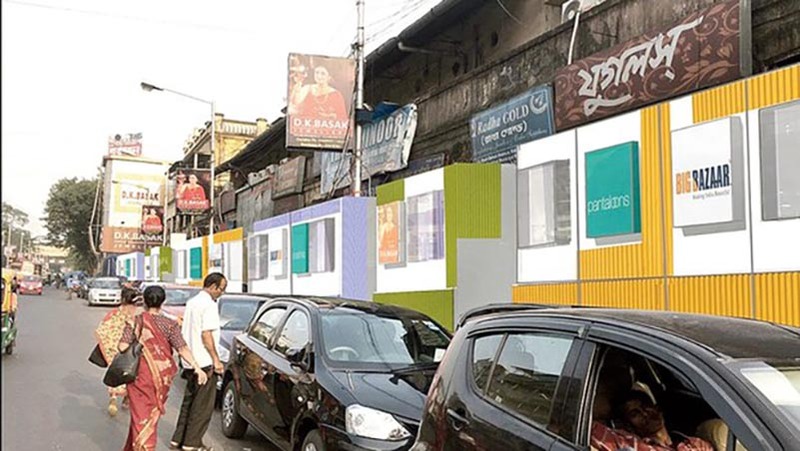 The permanent shops often complain of invisibility from the roads due to these temporary stalls,” said architect Abin Chowdhury, who led the initiative. The architects were keen on developing the pavements at Gariahat that have become a pedestrian hazard, particularly during the three months leading to Durga Puja. Given the staggering number of people on the streets ahead of the festival, a mishap during busy shopping hours would have disastrous consequences. With support from Gariahat police, the foundation took up the initiative to formulate an alternative to the current situation. To begin with, the street sections were documented to understand how temporary stalls and permanent shops interact with pedestrians. A minimum sidewalk width was left for pedestrian movement. Modular temporary structures had been proposed based on three sizes, depending on their locations on the sidewalk. “The structures proposed are essentially corrugated sheets mounted on the sides of steel structural members, with acrylic sheets on the canopy to allow light through during the day. The rear end of these stalls have been utilized for signages of the permanent shops they are located in front of. A green verge has been proposed along the rear end to increase the city’s green cover. A fire hydrant line has been proposed running alongside to provide backup in case of a fire,” explained Chowdhury. The proposal was readied in December 2018 and shared with the Gariahat Police for action as part of the Clean City Green City movement.